http://johnhttps://johnlchurchill.files.wordpress.com/2013/01/sword.jpg?w=410http:https://johnlchurchill.files.wordpress.com/2013/01/sword.jpg?w=410//johnlchurchill.files.wordpress.com/2013/01/sword.jpg « Bull in a China Shop! Why did St. Peter carry a sword? If you look more into the text, you see that among Jesus’ disciples there were two swords. That means two of his twelve disciples, Peter and another were carrying swords. I just wonder why they were carrying swords? I mean think about it, there is a God of the universe, he’s right there with them, and they are carrying swords. And to top it off Jesus does not correct or rebuke them for it. He does not opposed it. He knew they were carrying swords. Now they were likely carrying a Roman short sword. 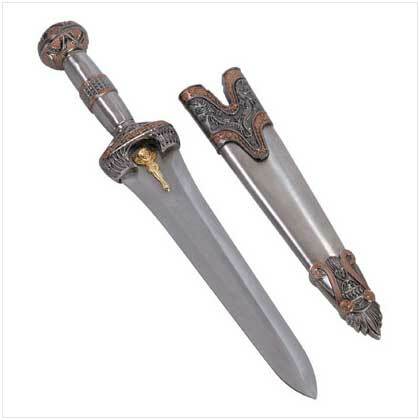 This is not necessarily the battle sword, but a sword for self-defense. So in modern-day vernacular, they would’ve been carrying a handgun. I guess in many respects, it makes sense that they were carrying a weapon. I mean, these were guys who travel for their ministry. They were out on the road quite a bit. The roads were very dangerous. There were criminals, thieves, and marauders out on the roads. It was unsafe. There also were wild animals around the roads in the countryside and the swords would’ve been very handy for self-defense. It seems to me that Jesus is okay with the person defending and taking care of himself or herself and their family. In fact we’re emplored to care for our family and part of that care is defending them when their safety is threatened. The Scriptures say, 1 Timothy 5:4, 8 (NIV) But if a widow has children or grandchildren, these should learn first of all to put their religion into practice by caring for their own family and so repaying their parents and grandparents, for this is pleasing to God….8 If anyone does not provide for his relatives, and especially for his immediate family, he has denied the faith and is worse than an unbeliever.